Ronald Reagan and Barack Obama are the 40th and 44th Presidents of the United States, respectively. Both men are considered among the most charismatic US Presidents, and they have also both had to deal with economic problems during their presidencies. Ronald Reagan was born in Illinois in 1911. He graduated from Eureka College with a BA in sociology and economics. Reagan's Presidency ended in 1989. Reagan was married twice and he had five children. In 1994, he announced that he had been diagnosed with Alzheimer's disease. Reagan died in 2004, aged 93. Barack Obama was born in Hawaii in 1961. He attended Columbia University and later studied law at Harvard. Obama is married with two children. Ronald Reagan began his career as a radio broadcaster in Iowa, moving to California in 1937 to take up a career as a film and television actor. Reagan appeared in more than 50 films during his career as an actor and he became a famous and popular public figure. His works included the films Kings Row and All American. Reagan became the Screen Actors Guild's president and he also worked as General Electric spokesperson. It was while Reagan was working for GE that he first entered into politics. Reagan was first a member of the Democratic Party, but he later became a Republican, in 1962. Reagan was twice elected as the Governor of California. Reagan attempted to gain the Republican nomination for the presidency unsuccessfully in both 1968 and 1976, but he won the nomination and the presidency on his third attempt in 1980. Barack Obama worked in Chicago as a community organizer before he attended Columbia University and later Harvard law school. After becoming a lawyer, Obama became a civil rights attorney in the same city. Between 1992 and 2004, he also taught at the law school of the University of Chicago. Obama's political career began when he served in the Illinois Senate between 1997 and 2004. Obama attempted unsuccessfully to join the House of Representatives in the year 2000. He then became a US Senator in 2004. Ronald Reagan served as the 40th President of the United States between 1981 and 1989. Reagan's presidency was associated with significant economic reforms, which came to be known as Reaganomics. These policies included tax rate reductions which were designed to inspire economic growth, deregulation of the economy, attempts to reduce inflation and reductions in government spending. Reagan was reelected President in 1984. During his second term, he was primarily concerned with foreign relations, including the end of the Cold War. Reagan is considered to be a popular US President, often ranking highly in opinion polls comparing the country's presidents. Barack Obama became the 44th President of the US in 2009. His first term will come to an end in 2013, when he may attempt to be reelected. Like Reagan, Obama's presidency has been largely focused on the economy since he has had to deal with the effects of the 2008 economic crisis which bloomed during the eight years of Bush’s presidency. Obama's best known policies include the economic stimulus legislation and health care bills. Obama set in motion the withdrawal of US troops from Iraq. He won the Nobel Peace Prize in 2009. Ronald Reagan and Barack Obama are the 40th and 44th Presidents of the United States. Both men's presidencies have been associated with periods of economic turmoil. 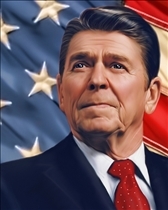 Reagan was President between 1981 and 1989. Obama's Presidency began in 2009. Reagan's presidency was linked with economic changes and the end of the Cold War. 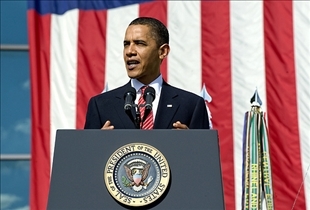 Obama's presidency has been linked with health care reform and the economic crisis recovery.